FIG. 10.9.4 Grate system for Martin resource recovery incinerator. FIG. 10.9.5 Van Roll grate system for resource recovery incinerator. which are keyed to a central element below. Each drum rests over a separate chamber to control underfire air. The unit rotates in the discharge direction at an adjustable peripheral speed which varies according to the constituents of the waste being burned. The drum shafts lie in the bearings placed in the outside walls of the unit, and each roller is fitted with a driving gear and can be regulated independently of the others. Ignition grates at the front end of the incinerator generally rotate at up to 15 m/hr (50 ft/hr). The burnout grates normally rotate at 5 m/hr (about 16 ft/hr) since they have little waste material to move. The room under the grate is divided into a zone for each roller, to which preheated or cooled flue gas (about 200 to 256°C) can be brought. 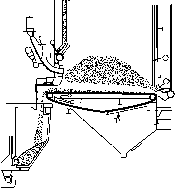 A special feeding arrangement carries the refuse from the feeding chute to the grate. FIG. 10.9.6 VKM or Dusseldorf process (with installation of transverse manifold for 260 secondary air nozzles over roller grate at Wuppertal, Germany). from 2 to over 30% of the grate area (Velzy 1968). 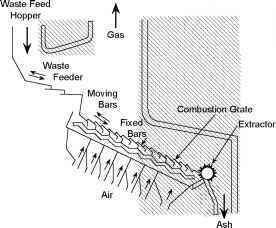 Proponents of the larger openings feel that the siftings (the ash from the fuel bed) should be allowed to fall below the grate as soon as possible and large amounts of air should be permitted to pass through the bed to meet the combustion requirements of varying fuel characteristics. 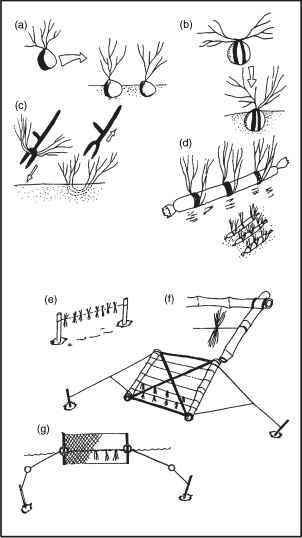 Proponents of the smaller openings cite advantages such as the small volume of siftings, the small amount of un-derfire air that is required, and the resulting shorter combustion flames, all of which reduce particle entrainment in the escaping gas (Velzy 1968). 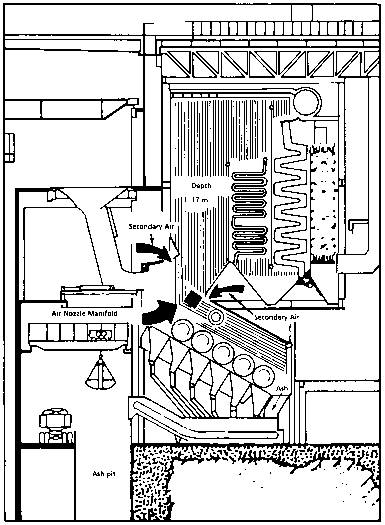 In a technique employed at some U.S. facilities, waste is pneumatically injected into the furnace system and burned while suspended in the furnace chamber, rather than being burned on a grate (see Figure 10.9.7). With the removal of ferrous metals and other noncombustibles in typical RDF systems, a boiler system has evolved and has been in commercial operation at Biddeford, Maine, since 1987. The controlled combustion zone (CCZ) boiler design is a state-of-the-art boiler design for both wood and RDF boilers (Gibbs and Kreidler 1989). The grate design must also be based on the manufacturer's design criteria. Basically, the only consistent design criteria used by manufacturers is the specified kilogram (pounds) of waste that can be loaded per square meter (square foot) of the grate area. Planners need more empirical data for proper design and must develop a more rational approach to select the proper grate. The firing furnace capacity is a function of its grate area and volume. The furnace volume is usually determined on the basis of an hourly heat release of 20,000 Btu/cu ft. If the hourly release rate is 20,000 Btu/cu ft and the heating value of the MSW is 5000 Btu/lb, the hourly firing rate is 4 lb/cu ft of furnace volume. A typical design basis is to provide 30 to 35 cu ft of furnace volume for each tpd of incinerator capacity (Velzy and Hechlinger 1987). 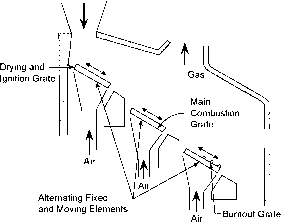 a combustion air requirements and predict combustion air flow and flue gas composition. Table 10.9.3 shows the stoichiometric oxygen requirements and combustion product yield for each waste component. The stoichiometric air requirement is determined directly from the stoichiometric oxygen requirement with use of the weight fraction of oxygen in air. Given temperature and pressure, the required volume of air can be calculated based on gas laws. If perfect mixing could be obtained and waste burnout occurred instantaneously, only the stoichiometric requirement of air would be needed. However, neither of these phenomena occurs in real-world applications. Therefore, some excess air is required to ensure adequate waste-air contact. Excess air is usually expressed as a percentage of the stoichiometric air requirement. For example, 50% excess air implies that the total air supply to the incinerator is 50% higher than the stoichiometric requirement. In general, the minimum excess air requirement for an incinerator depends on the degree of mixing achieved and waste-specific factors. Most incinerators require 80 to 100% excess air to burn all organics in the MSW (Wheless and Selna 1986). Incinerator operation is optimized when sufficient oxygen is provided to achieve complete combustion, but no more. Additional oxygen reduces thermal efficiency and increases nitrogen oxide generation.